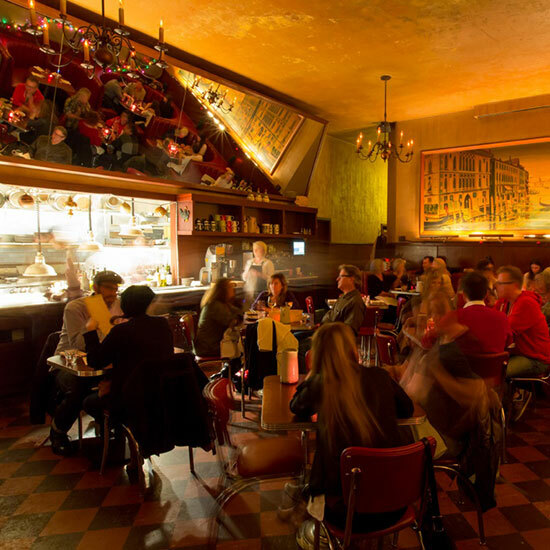 At Tosca Café in San Francisco, Ceri Smith's list is a combination of old bottles from serious Italian producers, like Felsina and Giuseppe Mascarello, to new bottles in straw fiascos from serious Italian producers. These wines had been out of the US market for a long time and they finally came back. They have all of these old vintages and they are just stunningly gorgeous. The quality is there and the structure is there and it's elegant. I mean down to the capsule—they're even meticulously and beautifully bottled. It's the most beautifully bottled wine I've ever seen. When I met with Josh Even, who is the chef de cuisine here, in the very beginning he told me what the menu would be like. He said, “I start with lemon, oil, salt capers, and add ingredients to it.” So it has that bright, fresh umami and acidity and suppleness from the oil. To me, it's easy to complement that sort of food with wines from Liguria, they have that salty brininess, seaside kind of thing going on. And the Punta Crena was a big surprise because it's made with a grape that nobody's ever heard of—Rossese—and it's a grape that everybody loves. I was really surprised because it was so light and delicate and people really love it. It's the antithesis of what I would expect people to like in California. It has spice and structure, almost like a heavy rosé. It's really pretty. You taste it and it's like, That's really good. And it's great with all of the food at Tosca—with everything. This is something that far exceeds the price in quality. It's from an estate that no one has really heard of. He's a young guy and he's got a really neat philosophy. He's kind of approaching Brunello di Montalcino the way that Barolo producers do, by separating out the vineyards into southern facing and northern facing. He's about 38 years old and he's aging in cement, concrete vats and using Austrian ovals and large boti. He's really doing things in the really more traditional, restrained, elegant way. He's kind of one of these younger guys who's doing things in the traditional way. I'm always a little skeptical of Brunellos when they're approachable upon release. It's like, what's this going to be like in 15 years, 10 years? But his Rosso drinks more like a Brunello when it's ready—which is great because his Brunello is too tight to drink right now. My Etnas. I love Etna. The Calabretta 2001 is beautiful, soulful and old school. It tastes to me like aged Barolo, in a way. His wines are the López de Heredia of Italy. They're just gorgeous. This is my baby—my little, kicky, tongue-in-cheek, let's have fun with this wine. My coconspirator on the wine program [winemaker] Randall Grahm said, “Is anybody making good wine in fiasco?” And I said, “I doubt it.” So I wrote to Michele Braganti from Monteraponi and said, “I have an idea. Would you guys ever consider bottling your wine in the fiasco?” And they wrote back immediately and said yes! And I kept asking him, “Is it going OK? Are you guys doing it?” And he said, “Yeah, yeah, we're doing it.” Finally, it came right down to the line and Michele wrote and asked me, “When are you opening?” I told him when and he said, “You will have your wine by then!” And sure enough, the day we opened, he airfreighted 36 fiascos to me. To have awesome wine in the classic straw bottle, in North Beach, which is so cheesy and old school, what better place to have it than at Tosca? Every wine list I kept researching from the old restaurant was Chianti, Chianti, in the '20s and '40s. I wanted that strong presence of Chianti.